Glow face with alarm. Travel Ben. glow digits at numbers. alarm works loudly. clock is ticking. oval shape. The clock is brass with a black face and double alarm bells. The face is marked "Bradley Alarm" and "West Germany" while the back is just stamped "Germany". There is a small dent on the rim that is shown in the last photo. A wind-up alarm clock; Linden, made in Germany. Case is red leather and folds up. Alarm and clock work. Phinney Walker wind up alarm clock. Clock is super clean, no scratches, and has been tested. Glow in the dark hands. I am not a clock guy but probably minor issue. Yellow, rooster is pecking at the feed, head bobs up and down when clock is running. Alarm works. No electricity or batteries are required for this clock. The ambient light sensor ensures the face is illuminated in the dark and easy to read. Also, features a loud alarm. LOUD ALARM- Easy to set loud and clear alarm with progressive interval ring. It is in very good, clean condition and works great! The clock has a silver finish with a white face. The face is marked "Westclox Big Ben" and "Made By WesternClock Co. La Salle, ILL, USA". The back is stamped with patent dates with the newest being 1919. It has a green case, black hands and numbers on white face. It is being sold AS-IS. It currently does not work but Alarm works, button on top turns alarm off. Paint is in very good condition; one small spot of wear. Vintage Painted Kienzle Wind Up Alarm Clock Works Great Exc Condition!! Vintage Painted Kienzle Wind Up Alarm Clock Works Great Exc Condition!!. Condition is Used. Shipped with USPS Priority Mail. Clock isnt moving not sure how to adjust it. Still a really nice piece at a great price. Free USPS First Class Shipping. Nice vintage wind-up clock. Smoke free home. Thanks for looking! It is by WESTCLOX, and is modelBaby Ben. More detailed photos below. This is in EXCELLENT/WORKING/TESTED condition. This is a nice little alarm clock. It works great and as you can see in the pictures is in really good condition. It is 3and 3/8” TALL. Vintage Guild Crest Wind -up Alarm Clock. Good Conditions. GERMANY MADE. It was not professionally checked for functionality, and sold AS IS. The clock was made in Germany. The clock is brass with a white face. The face is marked "The Automatic" and "The New Haven Clock Co. New Have Conn. Made in USA". The back is stamped "PAT. OCT. 20 1908". The alarm wind key is bent in place and the alarm set key is missing. 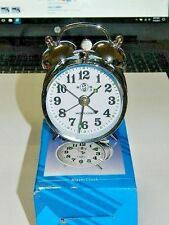 Here is aCYNA AMIC WIND-UP 11 JEWELS SWISS ALARM CLOCK WITH LEATHER POUCH TESTED . We do not profit from this, and we don't enjoy the extra paperwork on our end, but it has to be done. 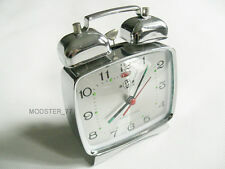 Vintage Westclox Travel Alarm Clock Wind Up 1950's Works! VINTAGE WESTCLOX WIND UP TRAVEL ALARM CLOCK Home And Away Time. Condition is Used. Shipped with USPS Priority Mail. Runs good. Keeps track of your home time and whatever time zone you set it for. Alarm is adjusted with setting on side of clock. Everything works. See pictures. Size 3" across 3.25" tall Alram and clock works,may need knob for stop button,some surface smears n stains (see pictures) Condition/vtg Good A Cool Retro Find! Vintage Westclox Travel Alarm Clock in Tan Case Wind Up Retro. Condition is Used. Works great. 12 - 58056. Wind Up Alarm Clock. Weighs about 8.3 oz. Semca 7 Jewels Swiss. The clock works. The case is about 3 1/4" by 3 3/8". LOOKS LIKE IT ALL WORKS AND WINDS UP. Pre-owned condition. Will need a good polishing. Alarm function works as it should. Up for sale is this UNUSED Vtg Westclox Big Ben 75-102 3A Wind Up Alarm Clock USA With Box with signs of wear & writing on the box. Has that retro look. Beautiful condition with light wear. Original felt on feet. Hand and dial glow blue in the dark. The clock is in good condition with signs of normal wear. It works properly. Alarm can sound with bell and/or with music (plays “la vie en rose”. -wind-up clock and music (on bottom). -glow in the dark hours, hour hands and minute hands. -brown plastic two tones - front has raised flower detail. ). Tested to ensure that it works. Made in Japan. Westclox Travalarm Wind Up Travel Alarm Clock. Roll Top Front. BACK STAND. WORKS WELL. ELGIN TRAVEL ALARM CLOCK. MADE BY ELGIN. YOU ARE BUYING A WORKING WIND UP TRAVEL CLOCK. HAS THE BOOKLET AND THE BOX. YOU ARE ONLY BUYING WHAT IS IN PHOTOS. Vintage Robert Shaw Controls Lux Time Wind Up Alarm Clock Great Seal Eagle. Condition is Used. Shipped with USPS Priority Mail. The main brass plate is a generous 1/16" thick, about 2mm. The face of the clock has a thin circular scrape where the alarm-set hand has rubbed. Don't know when this was made. Wind Up Travel Alarm Clock. 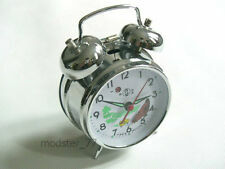 New in box Wind up alarm clock by Westclox. Color: white. No batteries, no electricity needed. Loud bell alarm. This clock is not working. For parts, repair or display. Does not wind.